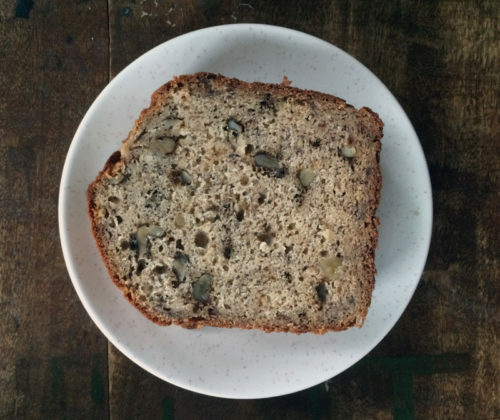 I’ve always been a little afraid of banana bread – too banana-y, too sickly sweet. But I’ve made some killer loaves, ones with chocolate chips and cinnamon topping, one flavoured with rum, a vegan version with cocoa and coconut, another with espresso, and one with candied ginger. But I’ve never made just plain ol’ banana bread. Something to let the warmth of banana shine. So when it rained all day yesterday and the sky was grey and dark, it seemed like a good time to experiment. My husband, who loves all things banana, loved this loaf. A lot. And so did I. 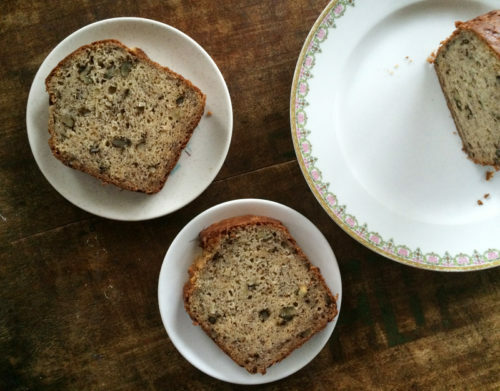 A banana hater yes, but a banana bread lover most definitely! This is exactly what you want on a rainy night and it plays so nicely with a cup of coffee on a cool September morning. Yes, this is my new favourite banana bread and I hope it becomes yours too. 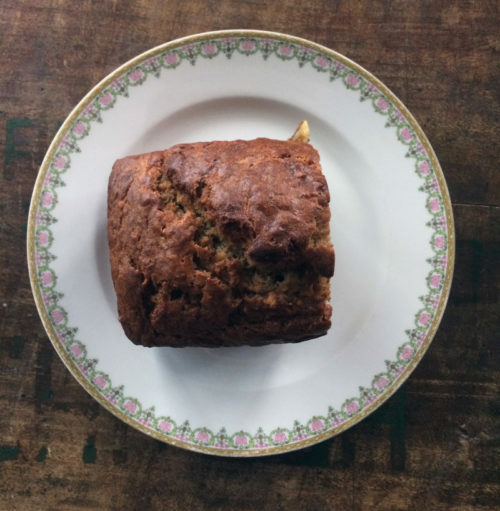 You could easily substitute chocolate chips for the walnuts, but I love the crunch the walnuts provide and how there’s no distraction – just pure, unadulterated banana bread deliciousness. *I use frozen bananas – bananas that get to ugly and brown get tossed in the freezer whole – so when I want banana bread, I just slice off the ends and peel off the skin with a knife. Slice the frozen banana into coins into a bowl and then let them soften on the counter or in a microwave until mushy – give them a good stir to get rid of any lumps. If you’re using over-ripe fresh bananas, just peel and mash them into a puree with a fork. Preheat oven to 350F. Lightly oil a standard size loaf tin and line with parchment paper, letting the excess hang over the edge. Lightly oil the parchment too and set aside. In a large bowl, combine the melted butter with the brown sugar and stir with a wooden spoon until well blended. Add in the mashed bananas and stir. Whisk in the eggs, yogurt and vanilla. Add in the flour, baking soda, salt and walnuts and lightly stir until just blended – be careful not to over mix! Pour the batter into the prepared loaf tin and bake for 65-75 minutes or until the top of the loaf cracks and a cake tester inserted comes out clean. Let cool on a wire rack for 10 minutes before removing the bread from the pan (use the parchment to pull the banana bread from the tin). Cool on the wire rack. I love trying new banana bread recipes, can’t wait to try this one! I have a freezer full of bananas. 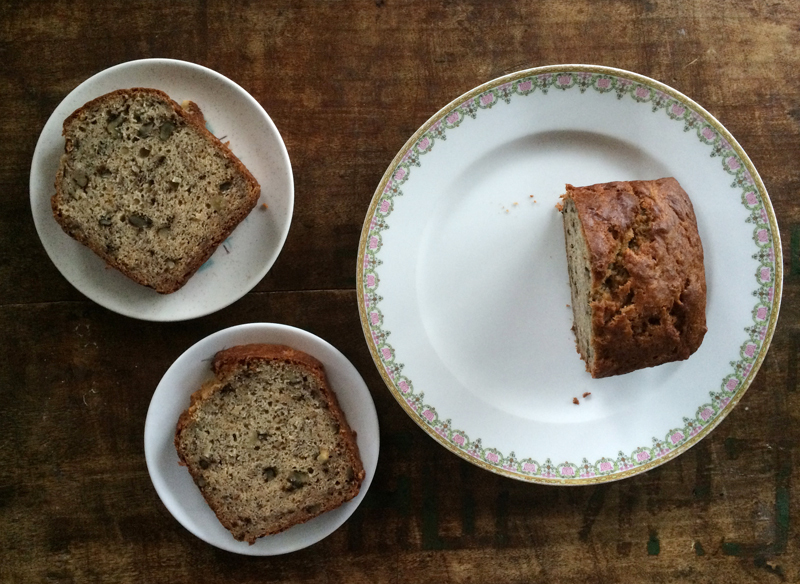 I remember making your banana bread with rum ages ago, right after I had discovered the world of food blogs! What a flashback! I haven’t made banana bread in ages! I’ll try this one. Can’t wait to try this recipe, during the winter I make a loaf about once a week. Sounds delicious! Amanda, I always love trying out new recipes too! There’s so many variations for bb & this one is definitely a good start. That rum one though, it’s a favourite too! RMW, it’s been a while for me too. Hope you love this. Always love banana breads! It looks great 🙂 Thank you for the recipe and pinned! I love Banana Bread and am always happy to find a new tried and trusted recipe. This is on the agenda for this week. Could you suggest a sub for the yogurt please? Would like to make this tonight but haven’t any. Pamela, I hope you love this one. Sorry Bill for the late response, but you can use soured milk (milk with a teaspoon of vinegar) or sour cream.